Militants affiliated with Islamic State of Iraq and Levant (ISIL) killed a Saudi soldier during a gunbattle on May 8 in a mountain village outside of Mecca. 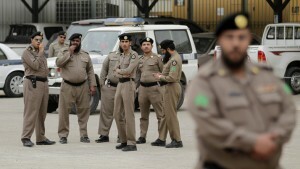 Saudi troops also found an explosive vest and bomb-making material after the jihadists retreated from the village of Thaqeef in the western Taif region, state news agency SPA reported. ISIL-linked militants have increased their attacks inside Saudi Arabia in recent weeks. On May 5, Saudi troops killed two ISIL jihadists and two others blew themselves up in a raid on the soldiers’ compound outside Mecca. On May 1, two suspected ISIL jihadists were killed and a third was wounded in southwestern Bisha province. ISIL views Shi’ites as heretics and opposes the kingdom’s Sunni Muslim rulers, whom it regards as having betrayed Islam through close ties with the West.